The following guidelines apply to test reading campaigns organised by Jellybooks. Reading data can only be collected for ebooks that have been provided by Jellybooks directly to you and only with reading apps listed as supported by Jellybooks. 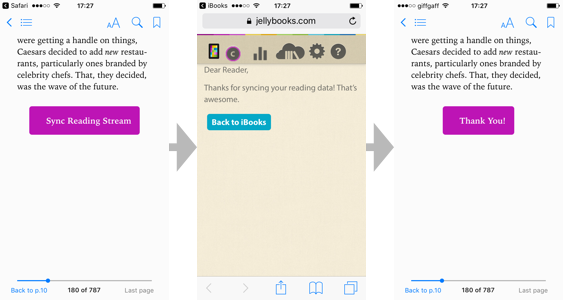 The reading data is collected by Jellybooks using a small piece of software called candy.js. The code is embedded directly into the ebook (provided as ePub3 file) that we make available to you the reader. Not all reading apps are suitable for use in test reading campaigns organised by Jellybooks. Please note that the list of apps supported by Jellybooks is much narrower than the list of apps, formats and devices that the book’s publisher supports. The collection of reading data imposes constraints that render some third party apps and devices unsuitable for use in test reading campaigns. If you find this to constraining, then please do NOT participate in test reading campaign organised by Jellybooks. The listing of an app on this page does not mean that the app’s developer has a commercial relationship, joint venture or similar with Jellybooks and the list below is a technical guide only and does not constitute an endorsement by Jellybooks or any other company of a specific ebook reading app or device. Important Note: Please use the Safari browser when downloading ebooks on iOS devices such as iPhone, iPad or Mac. The use of the Chrome browser for downloading any kind of ebook on iOS devices (this may happen if you are opening a link from your Gmail or Facebook account!) leads to major issues and lots of frustration because the Chrome browser on iOS does not process ePub files correctly (in fact any ePub files, not just those from Jellybooks). Important Note: Please do NOT use this app on Android or iOS! There are major bugs affecting the performance of this app such as the ability to sideload ebooks and the storage of reading data. These errors appeared when version 4 was released in December 2017 and are also present in the most recent version (version 4.4.2). This ebook reading app should be used by participants in test reading campaigns ONLY on PCs and laptops. Tip: You can download your ebook from Jellybooks to more than one device via the “My Books” section. Unfortunately, you will have to download the ebook anew to each device. The books will not magically “sync” all by themselves, like they do when you buy them from a retailer. You are nevertheless encouraged to check the compatibility of the app and device you are using by clicking the "sync reading stream" button on the support page that can be found at the very beginning of each ebook Jellybooks supplies. Important Note: Please do NOT use this app on Android or iOS! There are major bugs affecting the performance of this app such as the ability to sideload ebooks and the storage of reading data. These apps when version 4 was released in December 2017 and are also present in the most recent version (version 4.4.2). This ebook reading app should be used by participants in test reading campaigns ONLY on PCs and laptops. Note: Cloudshelf by Bluefire should not be confused with the Bluefire Reader (by the same developer) which does not support ePub3 as a file format and thus does not support the collection of reading data. Warning: Please make sure you have upgraded to version 4.0 or higher. This app has some known bugs. It is best to sync only at the end of a session and not at the end of each chapter. We strongly encourage users who are participating in Jellybooks test reading campaigns and reading on a PC or laptop to switch to Bookshelf by Vitalsource instead. Also, please note that Adobe Digital Editions (ADE) for Android is NOT supported by Jellybooks. You can read the ebooks we provide on multiple devices, but you have to download them manually to each device by going to the “My Books” section Jellybooks. Your reading stream will even show on which device you read (if the screen size changed, the color of your reading stream will change, too, if you look it up in “My Data” on Jellybooks). When using any of the apps above, the book will collect reading data and store it on your device. 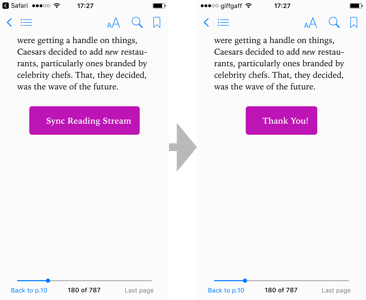 Once you press the purple “Sync Reading Stream” button, the entire database of reading data that has been collected and stored on your device for that specific ebook will be uploaded to Jellybooks. Data collected for other books will not be uploaded. Every sync action is unique to the book in which the sync button is clicked. However, this only happens if you are online. If you are offline, click the button the next time when you are online. Skipping a button does not lead to data loss, but clicking often is the best way to make sure all the data is captured. The data will not be deleted from your device after it has been uploaded. If the data has been successfully sent, the purple “Sync Reading Stream” button will switch to a purple “Thank You” button. Depending on the device, app, and operating system, you might see a web page saying that the data has been successfully sent, but in many cases, it is only the button that will change. If you are using Adobe Digital Editions (ADE), the app may occasionally get stuck on the “data received” page. This is a bug in the ADE application (generally a very buggy reading application), and not a Jellybooks error. If this happens, just close the book and re-open it. A workaround, if this becomes annoying, is to send data only at the end of a reading session when using ADE. Any app that is not listed in the supported ebook reading app list has to be assumed to be unsupported. Please contact us, if you think any of the above information is incorrect or outdated. Legal Notice: Trademarks are provided for identification purposes only. The mention of a trademark by a third party does not constitute an endorsement of Jellybooks by that Party. It also does not reflect any association by that company with Jellybooks. Information on this page is provided as technical help for end users only. Apple Books™, iBooks™ and Apple™ are registered trademarks of Apple Inc.
Bookshelf ™ and Vitalsource™ are trademarks of Vital Source Technologies Inc.
Kobo™ is a trademark of Kobo Inc.
Overdrive™ and Libby™ are trademarks of Overdrive Inc.